Kansas State knocked off No. 11 Texas, 87-69. West Virginia took down No. 18 Iowa State, 73-64. Northwestern upended No. 25 Indiana, 75-69. Miami handed Central Michigan their first conference loss, 70-67. No. 20 Rutgers held off Purdue in OT, 65-63. Ohio survived Kent State, 83-81. Why Mississippi State and South Carolina have one of the best hoops rivalries. 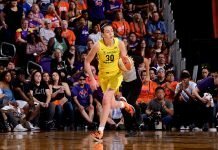 Oregon is much more than Sabrina Ionescu’s supporting cast. The return of Kadiatou Sissoko is bringing depth to Syracuse. At halftime, Iowa players talk, then listen. The Hawkeyes look to keep their momentum going. Utah is off to a strong start. Ohio State is seeking growth in a season of transition. It will be gut check time for BYU when taking on No. 13 Gonzaga. Houston is struggling in the early season. Around the Rim focuses on the Big Ten. Getting a much-needed win will require ending a losing streak to Alabama. Coach Holly Warlick is tending to the team’s defense and confidence. Baylor’s Kalani Brown credits her mom, and not her NBA dad, for her game. Why Jazzmun Holmes is Mississippi State’s X-factor against South Carolina. Maryland’s freshman duo is making an immediate impact. How Tennessee’s freshman have performed thus far. Utah freshman Dre’Una Edwards is stepping up. Australian guard Tara Manumaleuga has joined Arizona. Corey James mirrors Portland State’s growth even as she’s medically retired. The NCAA’s starting five for the week. Why Miami coach Katie Meier will put nostalgia aside tomorrow when her team faces Duke. Otis Hughley is bringing a wealth of knowledge to Auburn. Julia Aryault is a top 100 player, thanks to her twin brother. Key things to know about free agency. Alisha Valavanis is CEO of the Storm and Force 10 Sports. A’ja Wilson has joined the SEC Network as a basketball analyst. Which is worse, a rout or a close one?